1. Has Supreme Court ordered the reopening of Sterlite Copper Smelter?ANS: No. 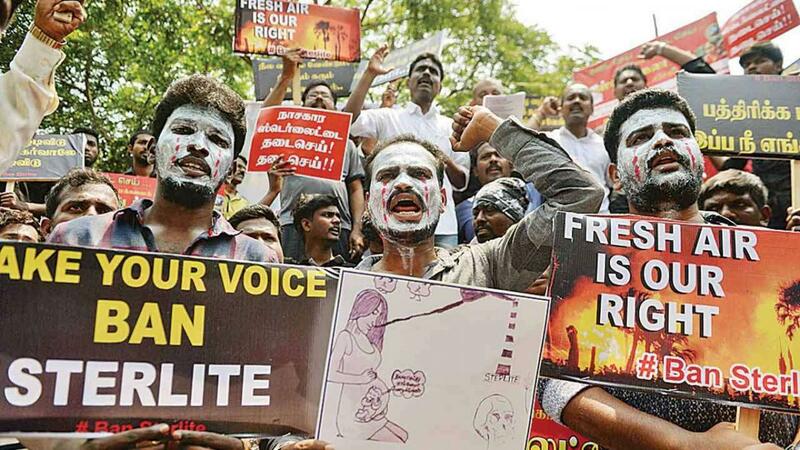 It has merely refused to stay the NGT order which quashed the order of the TNPCB rejecting Sterlite’s license to operate and the grounds for the same. It also passed an injunction on a stay of the NGT order obtained by Prof. Fatima of Thoothukudi in the Madras High Court. While quashing TNPCB and GoTN’s orders revoking Sterlite’s license and shutting down the plant, the NGT had also asked TNPCB to consider afresh the company’s application for renewal of license to operate. It held that the five reasons cited by it to reject the license are not valid. On 9.4.2018, TNPCB rejected Vedanta’s request for renewal of Consent to Operate citing five reasons:a) that the company had failed to submit monthly groundwater analyses resultsb) that the company had failed to submit periodic air monitoring results for heavy metals from an accredited laboratory;c) that the company had operated without a valid hazardous waste authorisation;d) that the company had dumped copper slag on the banks of River Uppar and failed to remove it and to build a retaining wall to prevent it from encroaching on the river;e) that the company had not constructed its gypsum pond as per CPCB guidelines. 2. Does this mean that the TNPCB now HAS to grant license?ANS: No. No authority can direct the TNPCB — a statutory body set up under the Water Act — to issue or reject a license. That decision is solely the Board’s prerogative. Judicial authorities can set aside an order of the Board and direct the Board to re-consider an application. However, when the application — in this case for renewal of consent — is returned to the Board, the Board will have to take a decision that is in line with the law, after satisfying itself that the applicant is deserving of a license to operate and after ensuring that the applicant has complied with all prior consent conditions. It also has to ensure that Vedanta — in this case — has all that is needed to ensure that its operations do not harm the environment. It cannot however, cite any of the five reasons already set aside (rightly or wrongly) by the Tribunal, unless the Tribunal’s order is reversed on appeal at the Supreme Court. 3. What can we expect now?ANS: You can expect Vedanta to write a fresh letter to TNPCB asking it to consider their applications for Renewal of Consent to Operate and renewal of hazardous waste authorisations anew. You can expect TNPCB to consider that application. You can hope that the TNPCB will do a better job of presenting violations and following procedures this time. TNPCB is expected to consider the submissions, take into account specific complaints raised by public and then decide on the application. 4. Can TNPCB reject the license once again?ANS: Yes, it can. But for such a rejection to sustain a legal challenge, it must be done lawfully and on unshakeable grounds. If the TNPCB finds a reason to reject the application — such as, say, a violation of a Consent Condition — it should offer Vedanta an opportunity to clarify its position and show cause why action should not be taken against it. Only if Vedanta’s reasons are not satisfactory can the TNPCB take the next step of rejecting the license. 5. Are there good grounds to reject the license?ANS: Yes. There are numerous grounds on the basis of which the factory can never be allowed to reopen. Fraud, misrepresentation of data and an irreparably under-designed facility are just a few such problems that present strong grounds for rejection of license. This by no means is the end of the road. There is many a legal slip between the cup and the lip.